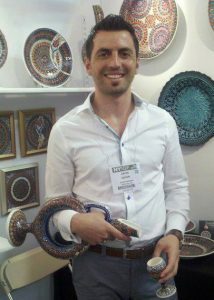 Zafer Guven learned the fine art craft of ceramic ware from his uncle who was a fifth generation master ceramic artist. With 150 years of family tradition behind him, Zafer has taken his art to a whole new level. Originally from Turkey, Zafer Güven now produces his pieces in Maine. He has been designing and producing ceramic art for over 15 years. Zafer incorporates Turkish ceramic methods in his production process. Kaolin clay allows Zafer’s intricate designs to have optimal color enhancement. Raised clay work and clear glaze allow for maximum light reflection. The kaolin collections include tiles, plates, bowls, vases, custom pieces, platters, urns, wine decanters, and goblets. Zafer also produces terra cotta pottery including plates, decanters, and goblets. In Zafer’s native region, Cappadocia, fine looms design and produce exquisite handmade oriental carpets. Silk, wool, and cotton rugs are produced using plant-based dyes. Beautiful carpets from small, independent looms in Turkey, Persia, Kazakstan, and Afghanistan complement the fine ceramic art at the Güven Gallery in Portland, Maine. New and antique rugs are available in an array of pile heights, color combinations, knot densities, and design themes. Carpet shipping is also available. Güven Gallery is located at 399 Fore Street in the Old Port in Portland, Maine. The gallery carries a fine selection of Persian carpets, Turkish carpets, and ceramics designed and produced by Zafer Güven. Validated parking is available for all Güven Gallery visitors and customers at the Fore Street Parking Garage.